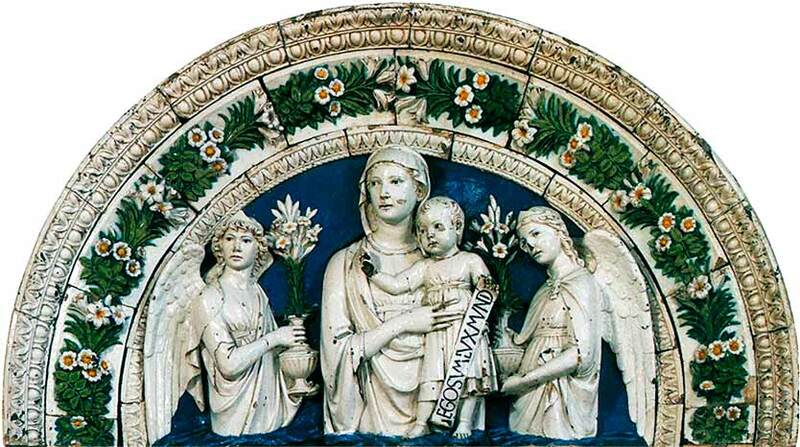 Enameled terracotta Madonna, originally used as a door lintel, by Andrea della Robbia, ca. 1491. 325 people in our community are currently praying with you. Alan Jackson’s country style fits this old folk hymn perfectly. It bespeaks the simple, hardy faith of the hardscrabble rural churches that sustained our forebears. Morning and evening, Lord, I beseech Thee, suffer my cry from this wood to reach Thee; these are Thy presents, Thy heart I find in the dark forest in sleet and wind. As on the sea Thou sailest before, a cloud, that our ship might see this shore, so now Thou walkest, these trees Thy feet, and in this brook Thy heart doth beat. Lord, I am fearless, Thy mercy shown, for where Thou art there is nought unknown; what are these seemings save Thine own? O grant Thy servant his grace of days, whose hours shall all be filled with praise: here Thy new works must numb’red be and fair names fitted to beast and tree. All to be learned, all to be loved, thus ever fresh Thy kingdom proved. Teach me your way, O Lord, and I will walk in your truth; Unite my heart to fear your name. I will praise You, O Lord my God, with all my heart, and I will glorify your name forever more. Great is your mercy toward me, and You have delivered my soul from the depths of hell. All praise be to You, Oh God my Redeemer, today and forever. I dedicate this day to you, mighty God. I pray that your Spirit will lift me up this day, and that your face may shine upon me all the day long, that I might do your will and lead a new life in Christ, reborn in the Spirit. 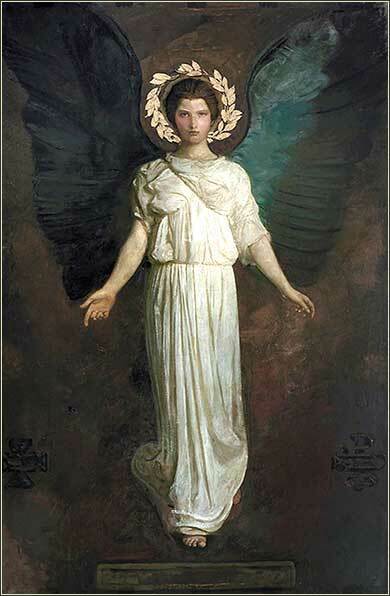 Another great angel by Abbott Handerson Thayer, ca. 1890. This one (using his elder daughter, Mary, as his model) is clearly classical in composition, and has a majestic quality, with a Roman olive laurel to represent peace. (You cannot serve God and mammon.) Therefore I tell you, do not be anxious about your life, what you will eat or what you will drink, nor about your body, what you will put on. Is not life more than food, and the body more than clothing? Look at the birds of the air: they neither sow nor reap nor gather into barns, and yet your heavenly Father feeds them. Are you not of more value than they? And which of you by being anxious can add a single foot to his height? Therefore do not be anxious, saying, ‘What shall we eat?’ or ‘What shall we drink?’ or ‘What shall we wear?’ For the Gentiles seek after all these things, and your heavenly Father knows that you need them all. The passage has two primary themes. First, stop worrying so much. Second, stop paying so much attention to lifestyle: How much money we make, what we wear, what we eat, what kind of car we drive, where we vacation. God gave us life. We can, therefore, trust Him to give us what we need to keep living. Of course, he also gave us brains as part of what we need to live: this isn't an argument for not visiting the doctor. It is an argument not to fret. God will provide for us. Wild birds get along just fine with practically no brain at all. God loves us even more than the birds, and He has given us intelligence; but He still feeds us, ultimately. Worry is, in any event, useless. If you lose sleep because you think you are too short, your worry will have one and only one result: you won't get enough sleep. If you worry about how you look, remember that the most beautiful things die quickly. Beauty will disappear. If we become attached to it out of vanity, we will become obsessed with something we are destined to lose, rather than spending our time building our treasure in heaven, which will last forever. For “Gentile”, read “pagan”. The false gods of the Gentiles were capricious and spiteful; the true God is eternal and loving. Once we learn about the actual living God, we should not be sucked into the follies of non-believers. The pagans of the 21st century will tell us we need a face lift and a $1000 wristwatch; but emulating them, allowing them to influence us, causes only anxiety about things that are ultimately illusory. To defeat anxiety, concentrate on doing God's will. Love and service will drive every foolish anxiety right out of our mind. Worry is banished when God becomes the dominating force in our live. Live one day at a time. We may plan for the future, but the future is guaranteed to bring surprises. We need the energy we might waste on worrying to meet the challenges of the present. And when tomorrow comes, we will do the same thing: Confidant that we will not waste our time on needless anxiety, we can be assured that we will have the energy to cope with the days to come. Problems will arise, and God will give us what we need to solve them.